7x10 Y click displays letters, numbers, and characters in a 7x5 font resolution. It carries a matrix of 70 yellow LEDs driven by a pair of 8-bit serial-in, parallel-out shift registers, a Darlington Transistor array and a Johnson counter. The click communicates with the target MCU through the mikroBUS™ SPI interface (SCK, SDO, SDI), with additional functionality provided by R CLK, MR#, LATCH and R RST pins. 7x10 Y click is designed to use either a 3.3V or a 5V power supply. 7x10 Y click is essentially a dual character display capable of showing letters, numbers, and characters in more readable typefaces since the 7x5 resolution is the standard one for displaying ASCII characters. This type of resolution is more readable than the 14-segment display. The dot matrix can also show scrolling text, thus fitting longer messages in small space. Two 74HC595 8-bit shift registers are used for driving the columns of the LED matrix separately. The 74HC595 is a 8-bit, serial-in, parallel-out shift register. 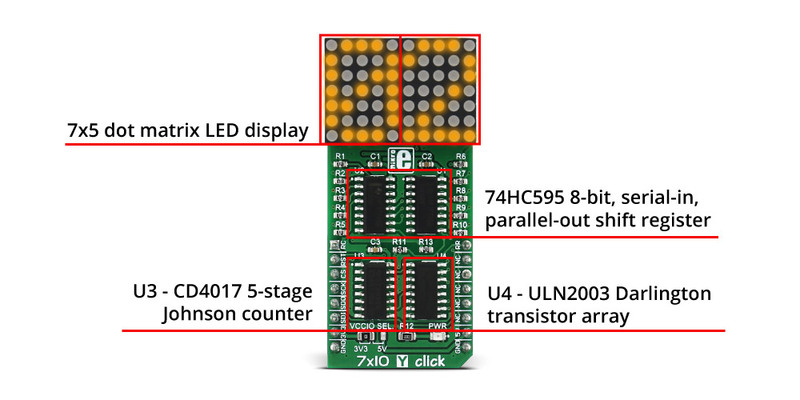 The rows of the LED are connected to the decoded outputs of CD4017 through ULN2003. CD4017 is a 5-stage Johnson counter and ULN2003 is a high-voltage, high-current Darlington transistor array. The Johnson counter (CD4017) performs the necessary LED multiplex and the current amplification that's needed for driving the LEDs is performed by a Darlington Transistor array.